The West Indies Cricket Board (WICB) will have to cough up nearly $42 million in order to stave off a lawsuit from the BCCI, stemming from the abandoned tour of India last month. Relishing at the prospect of leading the side in the the first three ODIs against Sri Lanka, India's stand-in skipper Virat Kohli said the hastily-planned series would be an exciting one, especially with World Cup spots up for grabs. Pakistan bowled out Australia for 261 on the third day of the second Test before opting to bat again and adding to its already sizeable lead in Abu Dhabi. Robin Bist's century and his 104-run partnership with Ali Murtaza had raised the hopes of an upset victory for Central Zone in the Duleep Trophy final against South Zone on Saturday. India's quest for the third opener in the Test cricket may soon end with KL Rahul. World No. 1 Novak Djokovic took a further step towards becoming the first player to retain his Paris Masters title when he saw off Japanese sixth seed Kei Nishikori 6-2 6-3 on Saturday to set up a final with Milos Raonic. Substitute Tolgay Ozbey scored an injury time goal as dominant FC Goa rallied from behind to beat Delhi Dynamos 2-1 and register their maiden win in the Indian Super League here today. League leaders Chelsea were made to battle for a narrow 2-1 win over strugglers Queens Park Rangers at Stamford Bridge as they maintained their unbeaten start in the Premier League on Saturday. Real Madrid turned up the heat on their La Liga title rivals when James Rodriguez scored twice, including a stunning volley, in a 4-0 win at Granada on Saturday. 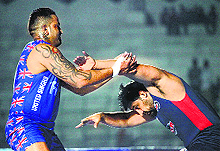 United Singhs pulled off a great win over Royal Kings USA in a close match of the World Kabaddi League here today. After trailing for three quarters, the Singhs came back strongly in the final quarter to pull off a 64-59 win that brought them to 18 points with nine wins in 16 matches. Royal Kings are at the bottom with six points from 16 matches. Raman Singh scored a brace as former champions Rail Coach Factory (RCF), Kapurthala, thrashed Indian Overseas Bank, Bengaluru, 4-0 on the fourth day of the 31st Surjit Hockey Tournament here today. Formula One’s cash-strapped smaller teams could boycott Sunday’s US Grand Prix unless their complaints about the division of revenues are heard, Force India deputy principal Bob Fernley said on Saturday. The West Indies Cricket Board (WICB) will have to cough up nearly $42 million in order to stave off a lawsuit from the Board of Control for Cricket In India (BCCI), stemming from the abandoned tour of India last month. The Indian authorities on Friday told the WICB that its losses as a result of the abandoned One-day and Test tour had been estimated at Rs 258 crore ($41.97 million), and gave the regional board 15 days to come up with a plan of compensation, reports Caribbean Media Corporation. The BCCI had announced two weeks ago it would seek compensation from the WICB for losses sustained as a result of the cancelled tour, and followed through with formal correspondence to the Antigua-based organisation on Friday. Media rights make up the bulk of the losses with the BCCI estimating them at just over $35 million, while ticket sales account for around $2 million and the title sponsorship from Micromax estimated at $1.6 million. The BCCI has also factored in losses in kit sponsorship from Nike, team sponsorship, in-stadia sponsorship and stadium concessionaires, in the compensation package. “The BCCI calls upon the WICB to formally inform the BCCI, in writing, of the steps it intends to take to compensate the BCCI towards the losses quantified above as well as those losses yet to be quantified by the BCCI in relation to the cancelled WICB tour,” said the letter, signed by BCCI secretary Sanjay Patel. Noting the figures outlined were “tentative and constitutes an approximation of the losses that BCCI is able to quantify at this time,” the Indian board said any other losses would be communicated to the WICB at a later date. 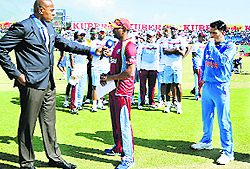 The BCCI also informed the WICB it was formally suspending all bilateral relations until the legal issues were resolved. Indian authorities were furious after the West Indies players quit the tour following the fourth ODI in Dharamsala, with an ODI in Kolkata and Twenty20 in Cuttack remaining. The three-Test tour, scheduled to bowl off October 30, was also scuppered. 19 Sep: The West Indies Cricket Board (WICB) and the West Indies Players’ Association (WIPA) sign a new collective bargaining agreement and MoU. The agreement, according to WIPA, was expected to bring “stability” to the system. 21 Oct: BCCI suspends all bilateral tours to West Indies after the emergency meeting. “There can be a lot of changes, a lot of twists and turns in the playing eleven. Going ahead everyone wants to do well knowing that the World Cup is not that far away. So that's an opportunity for all these guys to step in and make a strong impact and make a strong case for themselves,” Kohli said on the eve of the match. “I'm sure everyone would be geared up considering the fact that World Cup spots are up for grabs. 3 to 4 of these guys would be part of that squad. This is a very exciting series knowing that there are not many games left before the World Cup. “Everyone would like to get into the groove, especially as a team. We can test our combination and need to be very sure of what we want to do in the field and not try to experiment at that particular time,” he said. Drawing parallel with the 2003 scenario when Sourav Ganguly-led India made the World Cup final before going down to Australia, Kohli said: “Even we had a similar debate before 2003 but they made the final and it was one of our best performances. I hope we also do something exciting like that. If we have to perform, the planning should start from now. “We have to set our combinations right which will depend on our campaign in the World Cup. Obviously the squad will be selected from these bunch of players,” he added. Suresh Raina (in pic) is only 27 and on the cusp of playing 200-ODIs. The middle order batsman has form on his side. He hit 62 and 71 - both at better than a run-a-ball - against West Indies, and had hit a hundred against England in Cardiff. Raina has a lot of scope when it comes to finishing the innings. At stumps on Day Three, Pakistan were 61/2, leading Australia by 370 runs, with Azhar Ali unbeaten on 21 alongside Younis Khan on 16 not out. Apart from a classy 87 from Mitchell Marsh, Australia again disappointed with the bat, falling 309 runs short of Pakistan's 570/6 (declared). Already leading the two-match series 1-0, Pakistan surprisingly decided not to enforce the follow-on as it looked to bat Australia out of the Test. But two quick wickets in the second innings brought Pakistan's decision into sharp focus. Two fours and a six saw Mitchell Johnson carted for 14 runs in the first five deliveries of the innings — only for the paceman to come roaring back by removing Ahmed Shehzad's off-stump with a searing yorker. Fellow opener Mohammad Hafeez was back in the changing rooms soon after when a poor attempt at a pull-shot saw him lob an easy catch. Bist’s unbeaten 112 and Murtaza’s fighting half-century (50) helped Central stretch their overnight score from 214/4 to 403, gaining an overall lead of 301 runs. A 300-plus target on the Ferozeshah Kotla pitch was tricky, but KL Rahul, the Karnataka opener, made the chase look ridiculously easy with his second century of the match. In the end, South were just 117 runs adrift of lifting their 13th Duleep Trophy title, with nine wickets remaining. Before the South openers — Robin Uthappa and KL Rahul — had walked on to the field, it seemed like Central had turned the tables on their fancied opponents. At stumps, it was South, who were in total control of the game. South finished the day at 184/1, with Rahul unbeaten on 132-ball 121, a knock which contained 12 fours and five sixes, and Baba Aparajith on 30. Rahul’s another masterclass came on the back of his 185 in the first innings. Uthappa and Rahul got their side off to a perfect start with a 96-run partnership. The pace battery of Pankaj Singh and Ishwar Pandey hardly raised any alarms with their wayward line and length as the two Karnataka batsmen went about their business in style. Rahul smashed Pandey for three fours in the second over of the chase, while he was particularly harsh on the spinners, smashing them for sixes through the onside with utmost ease. 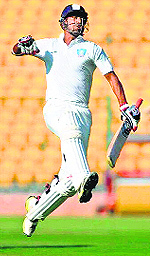 Rahul reached his sixth first-class century with a slog-swept six over deep midwicket off Chawla. Uthappa fell for 30 just after the tea break, caught and bowled by Piyush Chawla. His dismissal, however, did not curtail the flow of runs as Rahul continued to dominate the Central bowlers with his elegant shot selection. Rahul, who first lofted off-spinner Jalaj Saxena over midwicket for six, reverse swept him twice for four in the 28th over to make his intention clear. With Aparajith giving him support at the other end, the two put on an unbroken 88 run stand for the second wicket. Earlier in the day, Bist had steadied the ship for Central after they slipped to 260 for 7 in a little over an hour’s play. 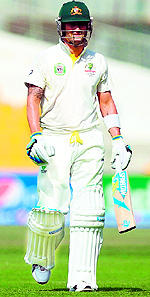 Bist, playing on 42 at that time, ran out of partners after Pragyan Ojha picked up two quick wickets. However, he found an ably ally in Murtaza, as the two scored at a brisk pace to take the fight to the opposition's camp. Bist took 111 balls for his first 50, but his next half-century came only in 63 deliveries. Murtaza, too, scored a 67-ball 50 which included one six and six fours. Abhimanyu Mithun provided the breakthrough when he dismissed Murtaza soon after the lunch, and off-spinner Shreyas Gopal snared the remaining two wickets. That Rahul, the 22-year-old Karnataka batsman, is in the form of his life would be an understatement. Two consecutive centuries, including his highest first-class score of 185, for South Zone in the ongoing Duleep Trophy final against Central Zone, to go with his 1033 runs in the previous Ranji Trophy season, might have tilted the scale in his favour when the national selectors will sit down on Tuesday to finalise India’s Test squad for the tour of Australia beginning this month. “I am a kind of batsman, who likes to get runs. You can score those hundreds only if you stay positive and attack the opposition bowlers,” Rahul told The Tribune. Canadian seventh seed Raonic earlier qualified for Sunday’s showpiece match, his second at Masters level, by downing Czech fifth seed Tomas Berdych 6-3 3-6 7-5. “The final tomorrow, it’s just about really buckling down, hoping to play another great match, and making the most of the opportunity ahead,” said Raonic. Serbian Djokovic, who is on a 26-match winning streak indoors, was never threatened by Nishikori, who beat him at the US Open but lacked energy after battling for almost three hours until late with David Ferrer in the last eight on Friday. Djokovic extended his advantage over Roger Federer in the battle for the year-end number one spot to 910 points. He raced to a 4-1 lead and never looked back, appearing effortlessly to send his opponent chasing the ball to every corner of the court. Following an early exchange of breaks, Djokovic stole Nishikori’s serve again in the sixth game of the second set and it proved enough. On a surface that keeps changing over the years, no player has retained their title at Bercy in a tournament held near the end of an energy-sapping season. It will be followed from Nov. 9-16 by the ATP World Tour Finals in London, for which Nishikori and Raonic qualified on Friday. The big-serving Raonic, runner-up at the Montreal Masters last year, followed up his quarterfinal defeat of second seed Federer by beating Berdych, the 2005 Paris champion. After firing down 21 aces against Federer, Raonic had to wait until the fifth game to serve his first on Saturday but by that time he had already broken Berdych for a 3-1 lead. Although Berdych read his serve pretty well, Raonic held and bagged the opening set when his opponent’s sliced backhand sailed long. 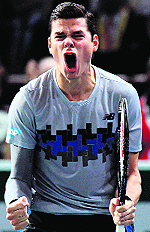 Berdych, however, broke in the second game of the second set as Raonic netted a backhand, before holding serve to level the tie. The third set was a much more balanced affair until Raonic set up the first couple of break points, which were also match points. He needed only one, wrapping it up when Berdych netted a backhand before smashing his racket on the ground in frustration, having made four consecutive unforced errors, including two straight double faults, in an awful game. Ozbey snatched the winner for Goa in the 90th minute after Shaikh Jewel Raja (72nd) equalised for the hosts. The Dynamos were put ahead as early as in the seventh minute by Mads Junker. The win takes FC Goa up the table with four points from five matches, while the Delhi side remained on six points from five games. FC Goa coach Zico made three changes, bringing in Mandar Rao Dessai, Romeo Fernandes and Jewel Raja and the move paid off as the trio put the opponents under tremendous pressure, especially in the second half to score the stunning win. The winner came from Eden Hazard who scored with a 75th minute penalty after Charlie Austin had pulled strugglers QPR level in the 62nd minute. Oscar had put Chelsea ahead with a curling shot with the outside of his right foot in the first half. Chelsea moved on to 26 points from 10 matches and stayed four points clear of second-placed Southampton, who won 1-0 at Hull City with Victor Wanyama crashing home a speculative 40-metre shot after three minutes as the Saints won for the 10th time in 11 matches in all competitions. Arsenal left Burnley without a win in their first 10 games by beating them 3-0 at the Emirates with Alexis Sanchez scoring twice and Calum Chambers also finding the net to move the north Londoners above West Ham United into fourth place. West Ham, who slipped back to fifth, came from 2-0 down to draw 2-2 with Stoke City at the Britannia Stadium. Cristiano Ronaldo set the European champions on their way in the second minute at the Nuevo Los Carmenes stadium when he clipped home a Karim Benzema centre — the Portugal forward’s 17th goal in nine La Liga appearances this season. For the Singhs, Gagandeep Nagra (18 raids) and skipper Sandeep Sandhu, who had seven stops, were the star performers. Nagra was adjudged the Man of the Match. In the other match, Punjab Thunder outplayed Yo Yo Tigers 82-39, which is the highest margin so far in the WKL. Meanwhile, California Eagles got maximum points without needing to flex their muscles as the Lahore Lions did not turn up. In their first league fixture, RCF were rarely challenged by the bank team. The Kapurthala-based team wrested total control right from the beginning. RCF took the lead in the 25th minute, when Sandeep Singh sent home a measured pass from captain Gaganpreet Singh. Five minutes later, RCF were awarded their first penalty corner, which Gouravjeet Singh converted to take his team into the half-time with a two-goal lead. RCF were awarded another penalty corner in the 45th minute, but missed out this time. RCF consolidated their lead in the 51st minute through Raman. In the 63rd minute, Raman deflected in a cross from Sandeep to give his team a big win. “Nothing is off the table at this point,” he said at the Circuit of the Americas. “Everything and anything is possible. The team owners need themselves to sit down and decide what actions they want to take and then make sure everybody is informed properly,” added the Briton. Force India, Sauber and Lotus have all had financial troubles and their bosses have all urged the bigger teams to create a more level playing field by ensuring that all have the means to compete. dURBAN: Thousands of weeping South Africans wearing red or black soccer jerseys said farewell to murdered national team goalkeeper and captain Senzo Meyiwa at a packed stadium in the Indian Ocean city of Durban. The mood was in part sombre, with red-eyed fans sobbing or blowing into tissues as a hearse carrying the 27-year-old's flag-draped coffin drove around the stadium, and at times festive as they blew vuvuzela horns and sang soccer chants. Meyiwa was shot and killed in what appeared to have been a botched robbery at his mistress's house on Sunday night, highlighting the scourge of gun violence in Africa's most advanced country. SHANGHAI: Frenchman Alexander Levy took advantage of ideal scoring conditions to card nine-under-par 63 and surge to a four-stroke lead after the third round at the BMW Masters on Saturday. Levy rattled off nine birdies to post a 22-under 194 total with one round left at Lake Malaren, while Welsh Jamie Donaldson (62), boosted by an eagle at the par-four 16th, vaulted into second place on 18-under, with German Marcel Siem (65) another stroke behind in third place. Halfway leader Nicolas Colsaerts of Belgium shot 73 to plunge nine strokes off the pace. Levy, 24, is seeking his third victory of the season on the European Tour. Los Angeles: Former heavyweight champion Mike Tyson was sexually abused when he was seven years old by a stranger on the street, he told US radio. The 48-year-old former boxer said an adult male grabbed him. “He bullied me, sexually abused me and stuff... snatched me off the street. I was a little kid,” he said. Tyson said he never saw the man again and never reported the incident to his parents or the police. “It was nobody’s business to know. I just lived my life,” he said. Tyson did not elaborate on what effect the abuse had on him, and said he does not feel any shame about what happened. New Delhi: Indian shuttler HS Prannoy crashed out in the semifinals of the $120,000 Bitburger Open after going down to lower-ranked Scott Evans of Ireland in the men’s singles event in Saarbrucken, Germany, today. Prannoy lost 16-21 10-21 to the 11th seeded Evans, who just took 33 minutes to wrap up the match and secure his place in the summit clash of the Grand Prix Gold tournament.